We are delighted to announce that Harry Rasmussen from Ashford has become a South East regional winner for Kip McGrath Education Centre’s UK competition Dream a Big Dream . The competition was open to 9-14 years olds and invited entrants to write about their dreams for the future whether they wanted to save the rainforest, fly to the moon or become a world-renowned author. Harry was especially pleased as he has never really enjoyed writing compared to his enjoyment of maths. The children’s entries were read and marked by a wide range of Kip McGrath Centre owners across the country and Harry arrived at our centre this week beaming with the news. Harry will now join the other 14 regional winners shortlisted to wait and see who will be selected as the two overall winners and get national recognition for their big dream. 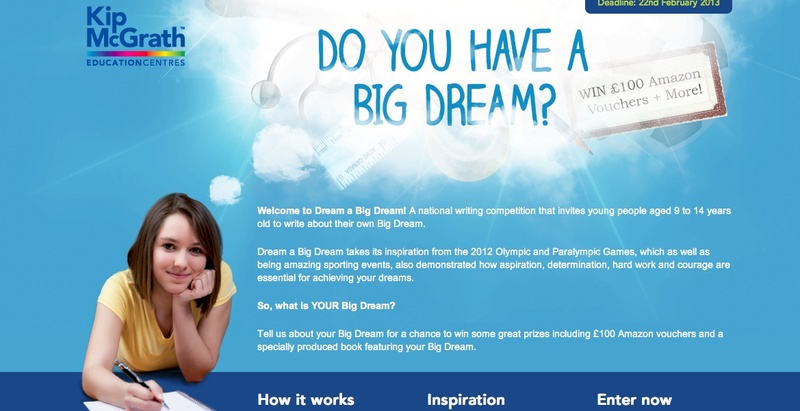 The results of the national competition will be announced at the end of March 2013 and the winners will receive a professional bound book featuring the winning entries, £100 Amazon vouchers and a signed certificate of congratulations from the athletes.